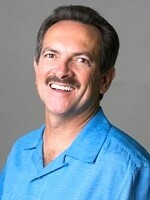 Have you ever done a real estate deal only to later realize you did get what you wanted or expected? Here’s your chance to learn many of the negotiation tools, tips and techniques that professional negotiators use every day to get the best deals. With the correct negotiation skills you can easily and effectively get what you want without having to drive a hard bargain. Your bargaining and negotiation skills are critical to your daily life. They’re absolutely essential if you work, have a family or purchase goods and services. On Saturday, September 17th from 8 AM to 5 PM at 1960 Skylar Hill Dr, Suite D, in Buford, GA and online via GoToWebinar, Russ Hiner will be teaching the Nuclear Negotiations Workshop to really help you sharpen your negotiation skills. This professional training will be fast-paced, high-energy and is going to get you over the hump in your negotiation techniques. Your life depends on the knowledge that you will learn at this training and will surely improve as a result! 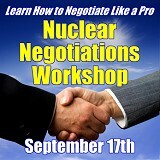 Tuition for the Nuclear Negotiations Workshop is discounted now through September 12th. As an early bird special, Gold Members are $49 each and Silver Members are $89. After September 14th, Gold Members will be $69 each and Silver Members $99. Register Now and Save!